Amazon opened the doors of its “store of the future” to the public today. The 1,800-square-foot Amazon Go is making waves over its cashier-less checkout system. The shop, first announced in late 2016 and located in downtown Seattle, uses a vast array of ceiling-mounted cameras to charge shoppers for the items they walk out with, a system that could transform the future of retail. The tech giant has attempted to break into the physical retail world before, to mixed results. But after acquiring Whole Foods in June of last year, Amazon now wields considerable leverage with which to reshape real-world retail, and test-runs of new technology could be a sign of things to come. The inaugural Amazon Go store is even designed like a Whole Foods, save for the rows of turnstiles blocking the entrance and the lack of cashiers. Customers swipe their phone and have to connect to their Amazon account in order to enter, and as they shop, hundreds of overhead cameras track what’s taken from the shelves, with no need to microchip the products. Visitors then have their Amazon accounts charged after leaving, although there are still some live humans on hand to guard the alcohol and restock the shelves. This approach is supposed to cut out the lines, but the system is less than perfect. Linking the shopping to Amazon accounts also places the mini-mart squarely in the boutique market, since Amazon has precluded the use of cash and food stamps. 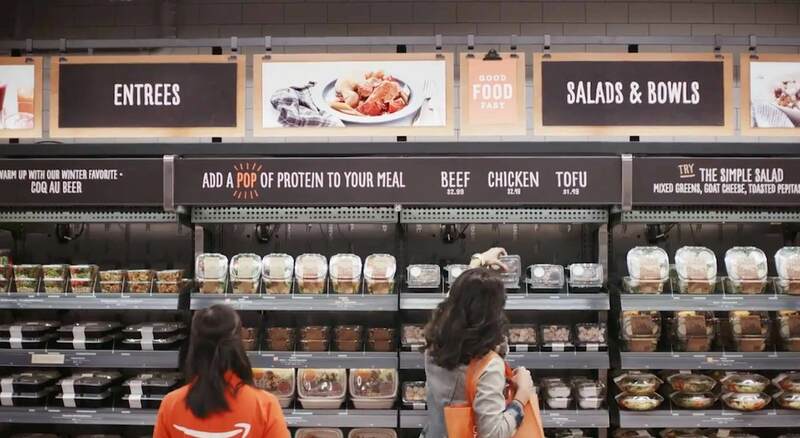 While Amazon has promised that it has no plans to replace any of the staff in Whole Foods stores, Amazon Go is stocked with the grocery chain’s signature 365 Everyday brand and their newly unveiled meal kits. The implication, that Amazon could replace the retail workers it now employs, isn’t without merit. Amazon has already reconfigured the urban fabric outside of its largest markets through the construction of enormous, automated distribution centers, and extending the practices honed in their warehouses into stores would be a logical next step. Amazon has already thrown brick-and-mortar stores into disarray and forced a re-evaluation of physical retail space once, and it may be poised to do it again. Below is a video explanation from Amazon of how the store works.